Cardioversion can be done using an electric shock or with drugs. Electric cardioversion is done with a device that gives off an electrical shock to the heart to change the rhythm back to normal. The device is called a defibrillator. The shock can be delivered from a device outside the body called an external defibrillator. These are found in emergency rooms, ambulances, or some public places such as airports. Electrode patches are placed on the chest and back. The patches are connected to the defibrillator. Or, paddles attached to the devices are placed directly onto the chest. The defibrillator is activated and an electric shock is delivered to your heart. This shock briefly stops all electrical activity of the heart. Then it allows the normal heart rhythm to return. Sometimes more than one shock, or a shock with higher energy is needed. An external defibrillator is used to treat abnormal heart rhythms (arrhythmia) that cause collapse and cardiac arrest. Examples are ventricular tachycardia and ventricular fibrillation. These same devices may also be used to treat less dangerous abnormal rhythms, problems such as atrial fibrillation. The defibrillator will be used when the abnormal heart rhythm cannot be controlled with medicine. Some people may need to start blood thinners beforehand to prevent small blood clots. You will be given medicine to help you relax before the procedure. After the procedure, you may be given medicines to prevent blood clots or to help prevent the arrhythmia from coming back. 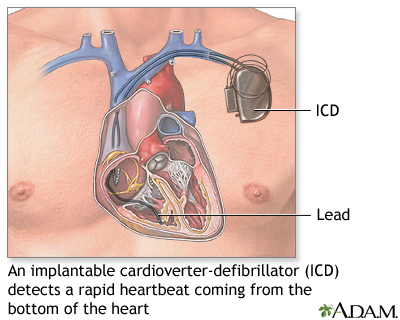 An implantable cardioverter-defibrillator (ICD) is a device that is placed inside your body. It is most often used in people who are at risk for sudden death because their heart function is so poor, or they have had dangerous heart rhythms before. The ICD is implanted underneath the skin of your upper chest or abdomen. Wires are attached that go into or near the heart. If the device detects a dangerous heartbeat, it sends an electrical shock to the heart to change the rhythm back to normal. Cardioversion can be done using drugs that are taken by mouth or given through an intravenous line (IV). It can take from several minutes to days for this treatment to work. This treatment is often done while in a hospital where your heart rhythm will be monitored. Cardioversion using drugs can be done outside the hospital. This treatment is most often used for people with atrial fibrillation that comes and goes. However, you will need to be closely followed-up by a cardiologist. You may be given blood thinning medicines to prevent blood clots from forming and leaving the heart (which can cause a stroke). People who perform external cardioversion may be shocked if the procedure is not done correctly. This can cause heart rhythm problems, pain, and even death. Al-Khatib SM, Stevenson WG, Ackerman MJ, et al. 2017 AHA/ACC/HRS guideline for management of patients with ventricular arrhythmias and the prevention of sudden cardiac death: executive summary: a report of the American College of Cardiology/American Heart Association Task Force on Clinical Practice Guidelines and the Heart Rhythm Society. Heart Rhythm. 2018;15(10):e190-e252. PMID: 29097320 www.ncbi.nlm.nih.gov/pubmed/29097320. Reviewed By: Michael A. Chen, MD, PhD, Associate Professor of Medicine, Division of Cardiology, Harborview Medical Center, University of Washington Medical School, Seattle, WA. Also reviewed by David Zieve, MD, MHA, Medical Director, Brenda Conaway, Editorial Director, and the A.D.A.M. Editorial team. Editorial update 10/04/2018.